The Ebola outbreak has stirred worldwide concern—and panic in some quarters. It is by far the largest outbreak of the deadly disease in recorded history. The media have jumped on the story for its obvious headline value, but at the same time they have served us poorly by misreporting, minimizing or simply refusing to report this administration’s glaring failure to protect American citizens. So what are the facts, and what kind of response can we expect from official Washington? As best can be determined at this point, the first Ebola fatality was a boy of two from the town of Gueckedou, Guinea, who died on December 6th, 2013 following a brief illness. He infected other members of the family, who in turn infected relatives and a health worker. These victims, in turn, carried the disease to other nearby towns. It took time however, for people to realize what was happening. A World Health Organization (WHO) timeline indicates the outbreak was first reported on March 14th, 2014, after eight people died in the city of Macenta, Guinea. Both Gueckedou and Macenta—about 50 miles apart—are major trading centers in the heart of the Guinean jungle and are located near the border with both Sierra Leone and Liberia. By March 19th, 23 deaths had been reported—all from the same area—with 35 suspected cases. By March 23rd, Guinea’s Ministry of Health reported Ebola had spread to the capital, Conakry, some 450 miles away. On March 22nd, the first Ebola death in Sierra Leone was reported. The 14-year-old victim died after attending a funeral for someone who had died in Guinea. Liberia reported its first victims on March 25th. By the end of the month there were a total of 81 deaths, including two in Liberia. Today the reported number of cases in Africa is over 9,200, with at least 4,604 deaths. The original source for this outbreak is believed to be tainted fruit bat meat. So-called “bushmeat,” including bats, primates, cane rats, big cats, dog and other sources, is widely prized by Africans, and there is a major black market for bushmeat among African expatriates here in the U.S. But bushmeat is a vector for a host of deadly diseases, including Ebola, monkey pox, HIV, Marburg and others. Primates and other animals may eat fruit already partially consumed by infected bats and imbibe their saliva, or otherwise come in contact with bat saliva or feces. These animals in turn become disease vectors for other animals and humans. According to one extensive video report from a Vice News journalist on the ground in West Africa, bush meat is brought into the tri-border region from the surrounding Guinean jungle by hunters. It is then transported to markets in nearby Sierra Leone and Liberia. Thus, tainted meat can wind up quickly distributed throughout the region. This is a possible explanation for its rapid spread. As shown in chart 1, both cases and deaths have grown exponentially. These are only the reported instances. There are likely many others that have gone unreported. 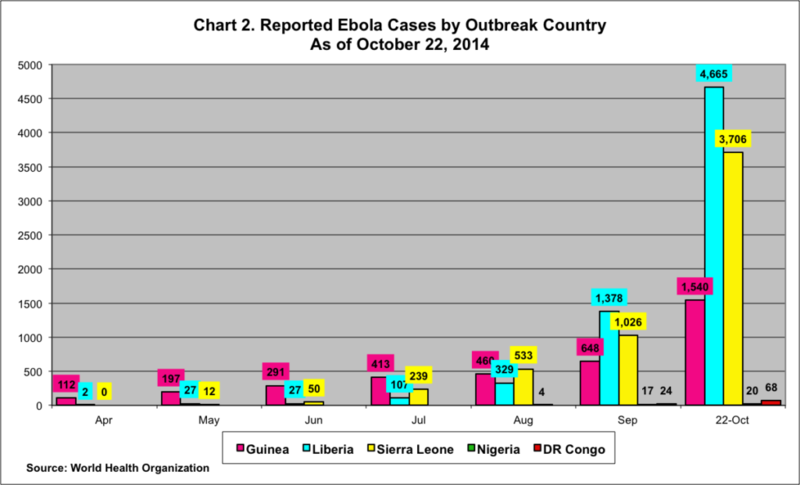 Chart 2 shows Ebola’s distribution by country. Despite the fact that it originated in Guinea, the growth of Ebola has been relatively linear in terms of the number of illnesses and deaths within that country. Sierra Leone’s caseload is growing fairly rapidly. Nigeria was recently declared disease free, but WHO has reported 20 cases and eight deaths there to date. The disease has also broken out in the Democratic Republic of the Congo–but this is apparently unrelated to the West African strain, based on genetic analysis. Liberia, however, has spun out of control. WHO predicts approximately 20,000 cases of Ebola by November, a reasonable projection if the disease continues to follow its exponential growth path. WHO refuses to project beyond November, but following that exponential growth path to January would see about 100,000 cases or more. The CDC has projected 550,000 cases by January 20, but claims that actual cases have been underreported by a factor of 2.5. Adjusting for this discrepancy, CDC projects 1.4 million by January 20. While Ebola is a deadly disease with a mortality rate of 50 to 90 percent, this epidemic must be put in perspective. It has spread rapidly in these African countries because of the short supply of treatment facilities, which are substandard in any event, characterized by poor hygiene generally, and the ignorance among the general population about treatment and ways to avoid infection. For example, some believe that they will die if they go to a hospital. Some infected patients have even fled the hospital, often assisted by family members who then get sick. Others have blamed medical personnel for spreading the disease. In September, eight health workers were murdered by people convinced they were bringing Ebola into their village. Many believe the disease doesn’t even exist and thus take no precautions at all. Ebola is not as easily transmissible as other more common diseases, some of which take many more lives. Influenza, the common flu virus, kills between 250,000 and 500,000 people worldwide each year, according to the World Health Organization. In the United States the range varies widely, but CDC has estimated that between 1976 and 2007 there were on average 24,000 influenza-related deaths annually. The 1918 flu pandemic, the grandfather of them all, killed 50 million people worldwide and 675,000 in the U.S. The 2009 H1N1 “swine flu” pandemic was the subject of worldwide handwringing at the time. Ultimately, it did infect about 61 million Americans, with 274,000 hospitalizations and 12,469 deaths. Worldwide, it killed between 150,000 and 575,000 people, which is indistinguishable from regular flu season mortality—although it hit young children harder. Some people believed the whole episode was hyped to enable massive spending for vaccinations. Whatever the case, it did not live up to the dire predictions that motivated Western countries to shell out billions to create a vaccination for it. However, it is Ebola’s gruesome symptoms and death rate that truly frighten people. While influenza kills many people every year, its death rate is about 0.1 percent. The 2009 swine flu pandemic had a mortality rate of 0.026 percent. Even the 1918 Spanish flu killed less than 2.5 percent of those infected. The latest Ebola epidemic was initially estimated to have a 50 percent mortality rate, but that has since been upped to 70 percent. Obama plans to import Ebola-infected patients from other countries to America for treatment at American taxpayers’ expense. The administration is keeping the southern border wide open despite at least 100 West Africans being apprehended there this year. Obama has appointed Ron Klain as his “Ebola Czar.” The man is an Obama insider, a political hack lobbyist with no experience in the health field who was at the center of the Solyndra scandal. He has missed two Ebola meetings already in the first few days since being appointed. In addition to his utter ignorance about Ebola, Ron Klain has cited overpopulation as the world’s biggest problem, especially in Africa and Asia. He also makes the incredible accusation that America is not engaged in world affairs. Currently 150 people per day enter the U.S. from West Africa, yet the administration insists on continued flights from West Africa, despite a bi-partisan call for restrictions. At the same time, he admits that screening in Africa has prevented 77 possibly infected individuals from boarding planes. Airline personnel are supposed to take the temperature of any West African passenger showing signs of fever—increasing the risk of contact with infected bodily fluids. A credible dire prediction was recently made by General John Kelly, commander of U.S. Southern Command, who suggested that an Ebola epidemic in Mexico or Central America would create a real problem: “If it breaks out, it’s literally, ‘Katie bar the door,’ and there will be mass migration into the United States,” Kelly said. “They will run away from Ebola, or if they suspect they are infected, they will try to get to the United States for treatment.” He also said with certainty that “there is no way we can keep Ebola [contained] in West Africa.” General Kelly is making preparations for a possible outbreak in Central and/or South America. At least one person in government is thinking. Finally, the Obama administration has sent—not 3,000, as they originally claimed, but 4,000—U.S. troops to assist in efforts against Ebola in Liberia. This will include 700 members of the 101st Airborne. They were supposed to be tasked with building special Ebola field hospitals to compensate for the inadequate facilities there. Recent reports, however, state that they will be in direct contact with patients. Despite this, they are not being issued any hazmat suits, just gloves and masks. Now Obama has called for the National Guard and Reserves to pack up for Ebola country. Many mistakes were made in the handling of Thomas Duncan, the Liberian man who was Ebola’s first fatality in America. Before he was positively identified as infected, Duncan had exposed up to 100 people to Ebola. Forty-eight are still under observation. Two healthcare workers who treated him have since been diagnosed with Ebola. The hospital has closed its emergency room. Consider the health crisis this one patient has created. Dallas, Texas emergency patients have fewer options now. With more cases, a nightmare scenario could arise where emergency care becomes unavailable to non-Ebola patients. This has already happened in West Africa. And despite CDC’s idiotic admonition to “think Ebola,” a healthcare worker returning from Nigeria coasted through, no questions asked. Louisiana Governor Bobby Jindal and other prominent Republicans have called for a temporary ban on flights from infected countries of West Africa. They have been joined now by 27 congressional Democrats, but Obama says he won’t change his mind unless the WHO does. A majority of Americans want the bans. In a nod to the pressure they are receiving, the Department of Homeland Security (DHS) announced this week that passengers from the three infected countries must come through one of five designated U.S. airports. The more I study about Ebola, the less I know about it. Everything we know about Ebola so far is based on a total of 2,400 patients from the past 24 outbreaks over 40 years. The longest set of generations has been five. (For reference, we are at 9,000 to 20,000+ patients, and we’re on generation 20 to 25 this time around). People are never frightened by statements like, ‘I don’t know, but this is what I’m doing to learn.’ But they do get scared if you tell them A or B with certainty, and it doesn’t happen—or if dueling experts tell you A and Z simultaneously. It’s time to reconsider our response, and if we hadn’t been so dogmatic about things we didn’t know, that wouldn’t be so hard. Did Dr. Frieden attend this meeting? No. Experts believe that Ebola would be difficult to use as a mass bioweapon, unless the effort was undertaken by a well-financed state with the proper infrastructure. Even then, it would be difficult to infect more than a few people at a time, unless a truly airborne variant was created—a difficult task, according to experts. But that does not mean nasty people won’t try. Cuban, Russian and Chinese doctors, nurses and “specialists,” have gone to Sierra Leone to “help.” More are on the way. You can be sure that among those “doctors and nurses” are bioweapons experts, anxious to get their hands on this new strain of Ebola. But they are not alone in seeing Ebola’s advantages. Sadly, there are others with demented visions for the uses of this disease. Some populate the American left. The monstrous Islamist group, ISIS, shares the lunatic left’s enthusiasm for Ebola. The group has suggested that suicide bombers inside the U.S. infect themselves with the disease, and once symptomatic, blow themselves up in crowded spaces like malls or subways. You have to hand it to them, they are nothing if not creative, but why do we observe so many leftists lining up on their side? This is a question that awaits an answer. Meanwhile, Judicial Watch reports that four ISIS members were arrested on the Southwest border around October 5. There is one, and only one, silver lining in this looming catastrophe. Obama’s poll numbers are plummeting. The November 4 elections may become a referendum on his leadership. If so, it will be a complete rout. If genuine leaders replace these feckless Democrats and useless RINOs, perhaps they can at least put a roadblock in front of Obama’s agenda for the next two years. If not, Katie bar the doors. I remember youtube channel had a expose Democrat for planning outbreak pandemic in America to disrupt Medical Martial Law?